The Doctor (Matt Smith and Amy (Karen Gillan) visit the Delirium Archive, a museum in the distant future, where they find a rather odd exhibit – a flight recorder inscribed with old high Gallifreyan symbols. After discovering it is actually a message from Dr River Song (Alex Kingston), who is currently travelling on the spaceship Byzantium 12,000 years in the past, the Doctor uses the TARDIS to save her before the ship crash lands on the planet Alfava Metraxis. Right from the spectacular opening scenes, where River sends the Doctor a message back through time “hello sweetie” before opening the air lock on the Byzantium, sending her hurtling through space and into the TARDIS, it’s clear that this is going to be very special adventure. The Time of Angels and Flesh and Stone (2010) are the fourth and fifth episodes from Matt Smith’s first season as the 11th Doctor, written by show runner Steven Moffat, and directed by Adam Smith. These episodes from Series Five also feature the return of Steven Moffat’s most frightening creations, the Weeping Angels, from his Series Three story Blink (2007). Here they return in force in an action packed storyline that makes them seem even more terrifying than before. While Amy gets acquainted with River Song, and her uncanny relationship with the Doctor, who still doesn’t know who she really is at this point because they both keep meeting at different points in his time stream, River tells the Doctor that the Byzantium’s cargo is a deadly Weeping Angel – a quantum locked stone creature that can only move when nobody is looking at it. As they survey the wreckage of the ship, River sends a message to a squad of military clerics in orbit, commanded by Father Octavian (Ian Glen), who beam down to help secure the Angel before the radiation leaking from the ship restores its full strength. Alex Kingston makes a very welcome return as River Song in this story, bursting back into the Doctor’s life once more, River’s still always inexplicably able to keep one step ahead of the Time Lord, though tragically – as we would later discover in Series Six – she’s also always moving one step further way from him as well. The complex nature of their relationship is a joy to behold. They behave like an old married couple at times, teasing and trying to get the better of each other, which in hindsight all seems rather apt now. With her trademark “spoilers” and TARDIS diary, River is a brilliant character, and here we get to enjoy what I feel is perhaps Kingston’s best performance in the role. Free of the continuity of things to come, River Song is a vibrant and unpredictable character. Later that sheen would diminish a little, but here she is both gloriously mischievous and mysterious in equal measure. I also like how River gets to fly the TARDIS and quickly forms a strong bond with Amy; and the two of them delight in winding the Doctor up – although he still manages to win over River’s uses of the blue “boring” switches by simply taking in the atmosphere outside the TARDIS to identify the planet they’ve landed on. The long journey through The Maze of the Dead takes a sinister turn when some of Father Octavian’s forces begin to go missing. As the Doctor and River talk about the ancient two headed race that built the statues, they suddenly notice how all the statues only have one head and must really be Weeping Angels! The slow, gnarled creatures begin to take shape, stalking them through the shadows, communicating with them by using the voice of the Cleric Bob (David Atkins), who they have slain. The Doctor has to help Amy after she believes her hand has been turned to stone, preventing her from moving, she is being influenced because she looked into the eyes of the Angel on the screen in the camp, so the Doctor bites her hand to convince her otherwise. Having been forced to the highest point in the maze by the misshapen Angels, they find themselves directly below the crashed ship. 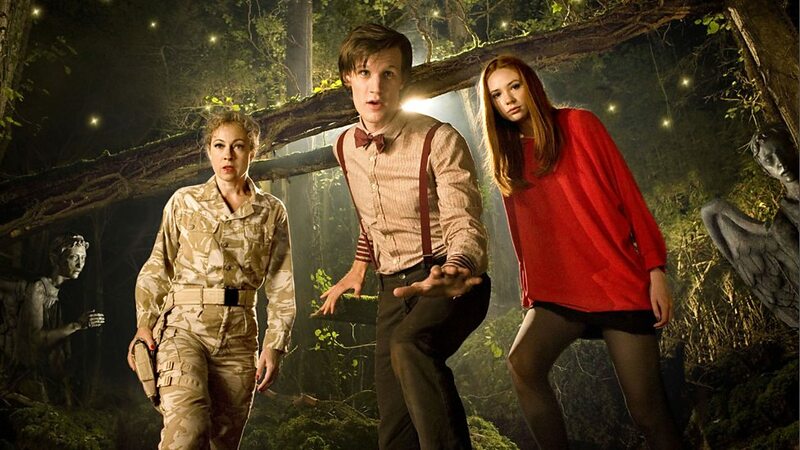 The Doctor shoots the gravity globe which allows them all to jump up into the Byzantium and escape the Weeping Angels momentarily, but the Angels quickly follow as they flee to the ships oxygen factory – a forest within the ship itself. After noticing a familiar crack in the wall of the secondary control room, the same one from young Amy’s bedroom in The Eleventh Hour (2010), the Doctor suspects the Angels are trying to feed on the time energy. Matt Smith is already settling into the role of the Doctor, bringing lots of his distinctive characteristics to the fore, which will become a mainstay for his incarnation of the Time Lord during his tenure. There is a lot of humour as well, particularly when he makes the TARDIS landing noise after River “parks” the ship. He also has to save Amy from the Angels, his fear for her is almost palpable when she is walking blindly through the forest, and his rage when trapped before he uses the gun to save them during the cliff-hanger of The Time of Angels is quietly restrained, and almost menacing in the intensity of Matt Smith’s delivery of his lines (Despite an animated banner trailing the BBC’s Over the Rainbow programme notoriously appearing on screen too early and spoiling this dramatic moment during the original UK transmission of the episode). I think this is what made Matt Smith’s 11th Doctor so good, right from the start his performance is more measured, and the way his Doctor often speaks very quietly to make his point is a marked change from his predecessors. When it becomes clear Amy has begun counting backwards, the Doctor quickly stops her, instructing Amy to keep her eyes closed to starve the Angel that’s gotten inside her brain and prevent it from killing her. 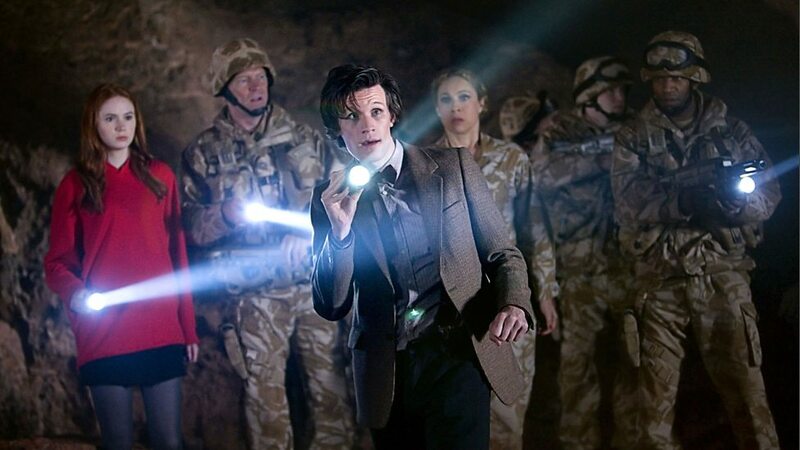 With Amy unable to move, the Doctor, River and Octavian go to find the main control room, the Doctor learns that River is actually a prisoner who has been released into Octavian’s custody, offering her help in return for a pardon. Octavian is later killed by the Weeping Angels. Meanwhile the crack in time continues to grow, swallowing up the Clerics guarding Amy in the forest. Now terrified and alone, Amy must then carefully follow the Doctor’s instructions to reach the control room. But as Amy blindly makes her way past the Weeping Angels she stumbles and falls, revealing her blindness, and they begin to turn on her. Fortunately, River is able to teleport Amy to the control room before the Angels can kill her. This is also a great story for Karen Gillan, who really gets to earn her stripes as a resourceful companion as she literally comes face to face with the Weeping Angels. Amy manages to switch off the security footage of the Weeping Angel, but she has inadvertently looked into its eyes, and allowed the creature to imprint itself on her brain. There is horrific moment when she rubs her eye and dust pours out as they are exploring the Maze of the Dead, and later her hand seems to turn to stone. Perhaps most chilling of all though is the countdown Amy does without even noticing she’s doing it; as the Angel continues to attack her from inside her own mind. Steven Moffat has crafted these scenes perfectly, as viewers it’s almost as if we are stumbling though the forest with Amy as she blindly struggles to escape only to disturb the Angels who slowly begin to turn around and notice her. 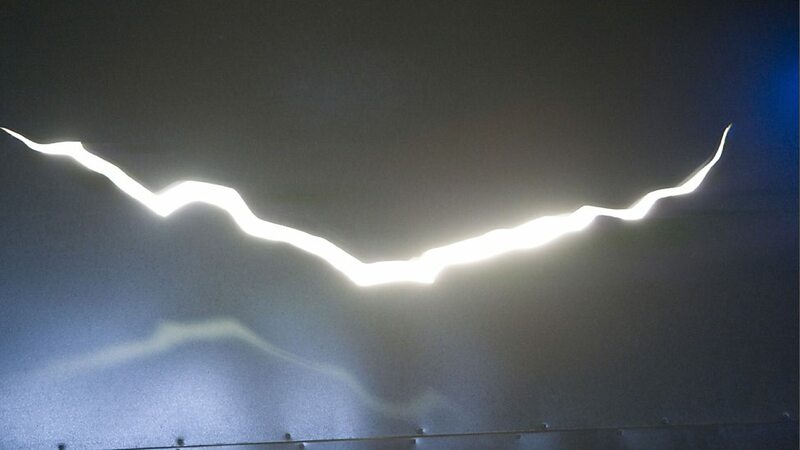 In Series Five the crack in time on the young Amelia’s bedroom wall plays a pivotal role in the events leading up to the series finale. In Flesh and Stone the Doctor begins to realise how the rift on the Byzantium is linked to the crack in Amy’s wall, which has begun to appear throughout time and space, erasing anyone from time that it comes into contact with, and is somehow linked to a massive time explosion. 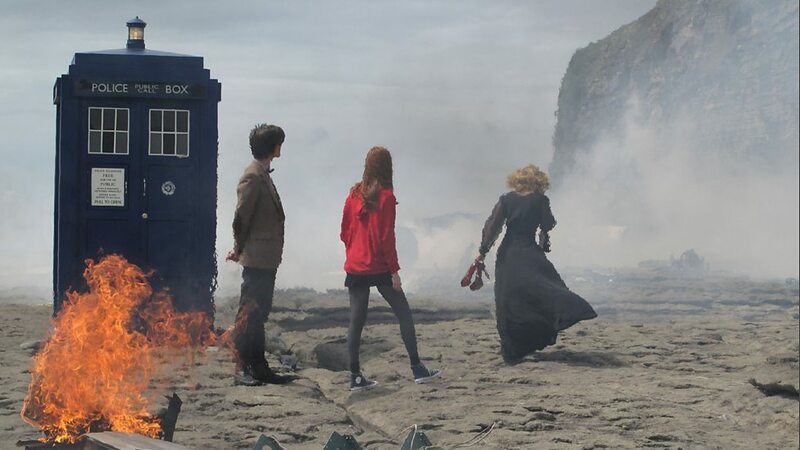 Although these plot threads are left unresolved for now, while the main story arc begins to focus more on Amy and Rory, the events linking the cracks in time would eventually fall into place – particularly a conversation between Amy and the Doctor in the forest in Flesh and Stone – during the complex series finale: The Pandorica Opens and The Big Bang (2010) when all of the Doctor’s enemies unite to imprison him in the Pandorica. The Weeping Angels themselves are as fabulously unnerving and creepy as ever. From the moment we see the Angel moving on the screen towards Amy, growing ever nearer, until it begins to emerge from the screen, much like the ghostly entity in the film, The Ring, they are always lurking in the darkness and ready to strike. The statues in the Maze of the Dead begin to come to life and turn into Angels; these lumpy, misshapen things are absolutely horrific as they stalk the Doctor and his companions. When the Angels use the voice of the Cleric, Bob, to taunt the Doctor, it offers an even more gruesome aspect to the Angels powers. On the ship they become full Weeping Angels, caught in the muzzle flash of gunfire, they advance relentlessly, before cornering Amy in the forest – a chilling scene in which the unsettling concept of actually seeing the Weeping Angels moving also becomes a reality. It is only really in the closing moments, when the Angels are sent tumbling into the rift that some of the tension is lost, and it feels like they were defeated a little too easily. Looking back at The Time of Angels & Flesh and Stone now, this exciting action-driven story by Steven Moffat is ingeniously constructed, it successfully broadens the mythology of the Weeping Angels established during their debut story, Blink, and slots perfectly into the ongoing story arc of Series Five while also remaining immensely enjoyable as a stand alone story in its own right. The special effects are also outstanding: from its exciting opening moments in space, to the brooding menace of The Maze of the Dead; through to the final showdown on the Byzantium, director Adam Smith’s work on these episodes is exceptional. The Time of Angels and Flesh and Stone are both thrilling episodes, with some terrific performances all round, together with the return of the Weeping Angels, this exciting two-part story is a real highlight of both Series Five and Matt Smith’s first year as the Doctor. Nicely detailed review, you’re right about the subtleties of Matt Smith’s performance and his delivery of lines. Both David Tennant and Matt Smith were great Doctors and I have a feeling that series 9 is going to knock it ‘over the top’ for Peter Capaldi (judging by the trailers at least)! Thank you. The Time of Angels and Flesh and Stone is one of my favourite stories from Matt Smith’s first season as the Doctor. I also think this is one of the best adventures to feature River Song, the character works really well here. 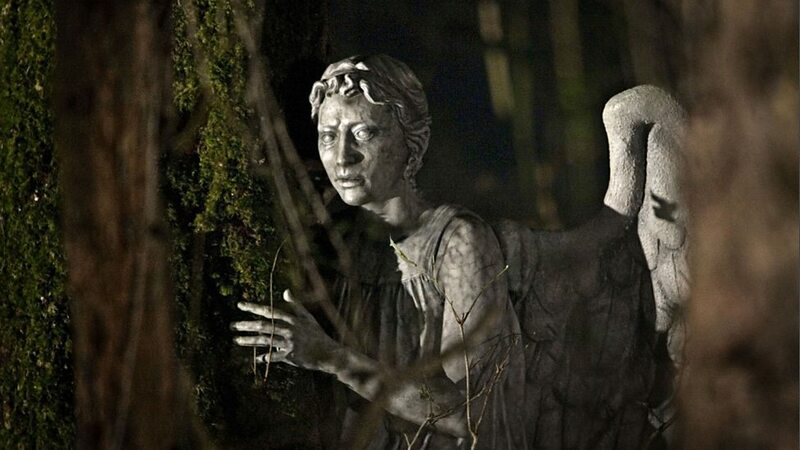 The Weeping Angels are also very scary, especially when Amy has to get past them in the forest. I’ve enjoyed watching all the new Doctor’s, I agree that series 9 looks set to be one of the best yet, and I think Peter Capaldi is brilliant as the Doctor. Glad you enjoyed the review, might cover a few more 9th, 10th, and 11th stories in the future maybe along with some more classic series reviews as well. Excellent, I’ll look forward to those – planning to cover some classic Who somewhere down the line myself as I’m watching a lot of it of late. Thank you. I’ve reviewed a few classic stories in the past, haven’t had much time to do any for a while, but have begun working on a few now. As much as I enjoy watching New Who, I always enjoy revisiting the classic series as well as there are so many brilliant stories!